I have been hearing so much about slow cooked roasts and casseroles and have been pretty intrigued by it. I mean I'm not one for slow activities which involve a lot of patience and concentration, but I just had to try it out once, after all the ooh's and aah's about how great they tasted and how tender the meat was. 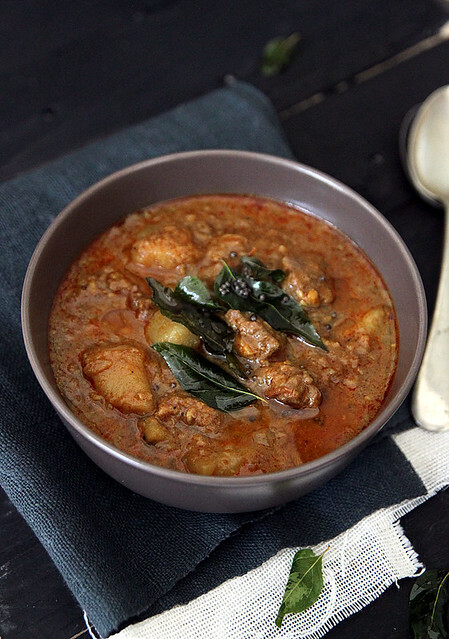 Whenever I cook something with beef or pork, I end up using the good ol pressure cooker and although it reduces the cooking time drastically and does the job of cooking the meat, I somehow feel all the curries I make in the pressure cooker tastes the same, no matter what different combinations of masala I use. So the other day when I picked up some stewing beef, I decided to go ahead and try this whole slow cooking method, not in the oven, but on the hob top..just to see if it was fabulously different and worth wasting all that energy (literally too). I don't have a slow cooker/ crock pot and so I could only experiment with slow cooking using a heavy bottomed cooking pot. The procedure took almost 2 hours and I was thoroughly pleased with the outcome. Unlike a slow cooker, I couldn't just leave it on to do the job, but had to keep checking it on and off- liquid levels, stir to prevent scorching and so on. I personally thought it tasted much much better than the curry made in the pressure cooker. For one, the masalas had nicely caught on to the beef cubes and the potato was cooked to perfection. Since the stew turned out so well, I decided it was a waste to serve it with frozen chapathi's. So I immediately turned to my trusted appam mix and whipped up some batter and set it aside to ferment. I know I would be a disgrace to the food blogger community by saying this, but I love love love ready mixes of any sort:). Anyhoo, I lovingly served it for dinner, quite looking forward to the fact that Ro would most certainly notice the difference and sing praises only to be slightly let down. He didn't utter a word even after a few mouthfuls and I finally lost it and asked how the stew was. 'It nice, its the same stew you always make right?' was his reply. I then had to explain to him that it is a slow cooked stew..2 hours I spent slaving over it and it HAS to taste different from the usual. He still didn't get it. His reply was 'you just wasted 2 hours of electricity on a stew that would have taken just 15 minutes to prepare in a pressure cooker???? You talk about energy conservation all the time, what about this then??' I just rolled my eyes and let it pass. I still believe the stew did taste fabulously different from my usual pressure cooker stews. Please, if anyone tries it out, do let me know what you think, so I don't feel horrible about all that energy I could have conserved. Also, somewhere along the way my blog turned 3, well on may 29th to be precise, and since I don't keep track of stuff like this, it wasn't a big deal. It was only recently when someone asked me how old my blog was, that I realized I should go and check and yes, it had turned 3 :) So I'm gonna consider my first ever slow cooked recipe as a milestone achievement and make a big deal out of it on this 3rd anniv. Hope you enjoy the stew. Crush/ grind together coarsely the shallots, ginger, garlic and green chillies. Heat oil in a heavy bottomed pot and throw in the crushed mix. Saute on medium heat till they turn a light brown in colour. This should take about 10 to 15 minutes. Make sure this mix is really cooked well and turns brown or else the curry would be sweet. Add the chopped tomatoes and saute for a couple more minutes, till they turn mushy and the oil starts to separate. In goes all the masala powders- turmeric, chilly powders, coriander, pepper and garam masala. Saute till the raw smell disappears and the oil becomes visible. Add a dash of water if its sticking to the bottom of the pan. Add the beef along with the potato (if using), half of the curry leaves and enough salt. Mix it all in, making sure the masala coats the beef and potato well. Add about 1 cup water, give a final stir and close with a lid. Cook for about 1.30 to 2 hours on low-medium heat, stirring in between (carefully, as you don't want to mash the potatoes), checking liquid levels and adding water as and when required. However, don't over do it. Once the meat is completely cooked add the coconut milk and check for salt. Keep on medium flame for about 10 more minutes and take the stew off the flame. Heat the coconut oil in a kadai and splutter mustard seeds. Pour this over the cooked stew and give a final stir. Serve with chapathi's, appam, bread or even idiappam. Notes: You can use any cut of meat. The one advantage of slow cooking is that it makes the meat quite tender whatsoever. If you cant find shallots, 2 medium sized onions would do. You can omit the coconut milk and just do with water. The coconut milk however gives it a very distinct taste. I also sometimes add some thinned out coconut milk along with water. The tadka can be done in the beginning as well, before you add the crushed mix. Try this with mutton or lamb and it would be just as good. 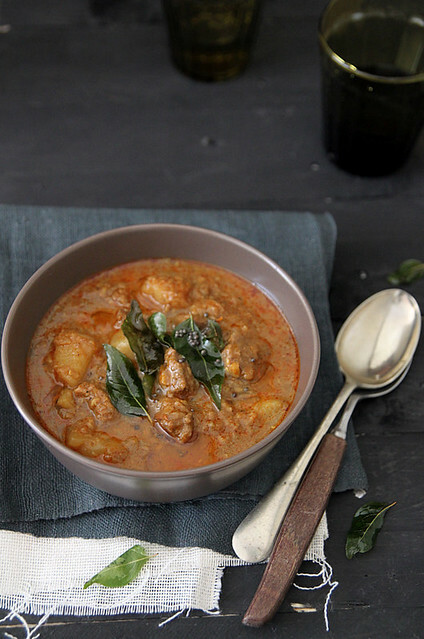 The curry is slightly on the spicier side, so avoid the chilly powder if you are not up to it. I have also tried adding whole garam masala right at the beginning with the oil, and i think i like that better. If at all you did want to make this in the pressure cooker, do all the steps as above in a pressure cooker, add water and close with the lid. Cook for about 18 minutes or 5 to 6 whistles (you'd know how long the beef you get usually cooks). Open, check if meat is done and pour in the coconut milk. Bring to a boil and then take it off flame. Continue with the remaining steps. Congratulations on completing 3 years!! Wish you many many more years of blogging! And definitely want to try slow cooked meats. Slow cooked beef stew looks yummy..Looks worth the 2 hr effort...Love the clicks.. 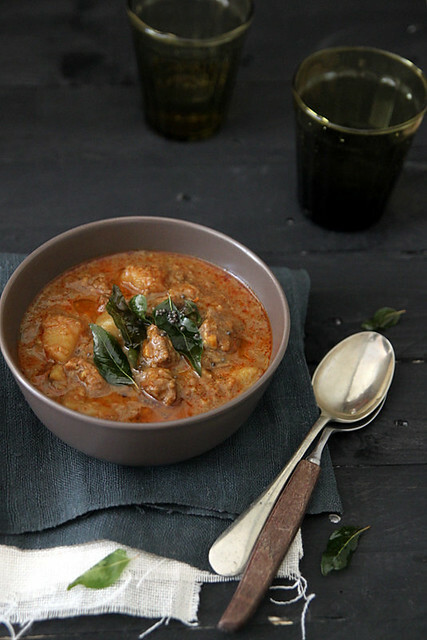 This curry reminds me of mutton curry and it's always worth all the pain, energy and time! Like I said before .. love the tone in all the photos. This looks delicious.. never thought of adding beef to Indian food and potatoes. Btw.. my name is Nisha too, and I couldn't agree more, NYC is pretty awesome, London is second. :-) Really like your blog. 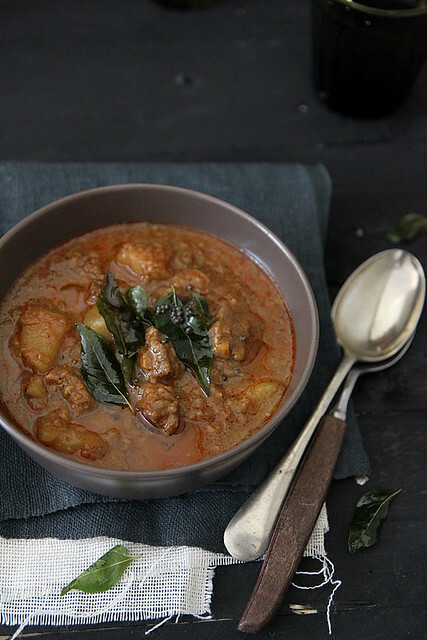 One of our fav go to dishes is beef curry cooked in the pressure cooker. We almost never seem to have the time for the slow cooked version. we take it out of the cooker and then let it simmer for a bit till it reduces. bet the slow cooked version tastes delish too. aah! that with some chappathi or bread and yummo! Sounds delicious & congrats on your 3rd birthday. Irresistible,droolworthy and totally inviting stew, my hubby will definitely love this.Never thought of making dishes with meat this way,i'll always go for pressure cooker,that makes the life easy na. Congratulations on your 3rd blog anniversary! Lovely curry! your blog is a revelation to me. i have just discovered it and would love to try everything i saw in the past hour... the only problem is : where to get all the indian spices...?? I have tried slow cooking beef once but for a dry version with diced beef,it took more than 1 hour but later on i started using presure cooker but to me the slow cooked version tasted much much better than pressure cooked one...these days we r not into red meat..health conscious !! This curry looks sooo soo delicious ! Happy 3rd blog anniversary !!! Beautiful presentation and clicks ... I don't eat beef but that curry does look out of this world,reminds me of mutton curry. I believe the flat appams are called Vellayappams. At home, we always "Ollarthify" beef. 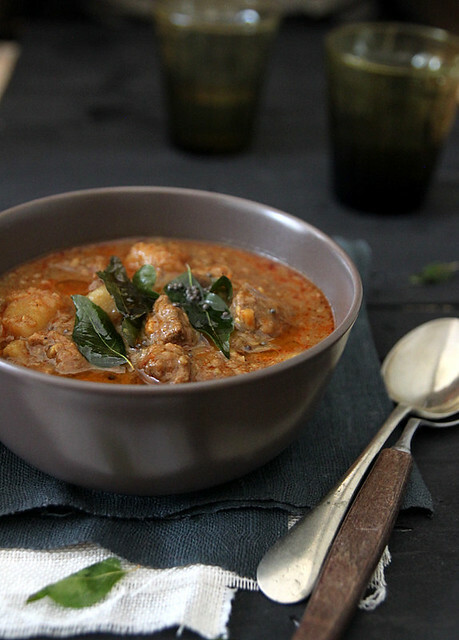 This looks like a nice change, and with all the gravy, it should be wonderful with appams. i want to eat this! looks gorgeous!